ON CANAL is a district for pop-ups where brands, artists & startups can test out new ideas and engage with the public in a high traffic location at the intersection of SoHo and TriBeCa. Twenty previously vacant retail storefronts, a majority of which sat empty for years, are now operated by Wallplay, the experiential arts & innovation network that repurposes empty spaces. ON CANAL is co-curated by Vibes Studios, with the aim of creatively re-imagining retail. Joe Garvey is an artist based in New York who has launched a T-shirt collection that combines disciplines within print, art and design driven by the exploration of popular iconography. The aesthetic blends band merch, streetwear and graphic art. Garvey strives to make clothing that is both multi-purpose and plays into feelings and physicality of nostalgia. His installation "Embassy 02" includes work by Garvey and his friends. On view September 6th - 27th. 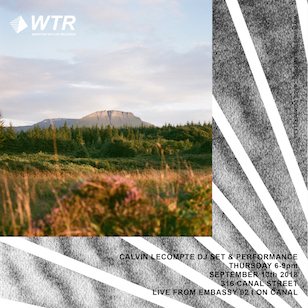 Calvin LeCompte is a New York-based musician whose raw and spontaneous sound uniquely defies musical conventions. Channeling New York’s experimental music scene as much as jangly, lo-fi pop, LeCompte’s song-writing preserves the hisses, cavernous voicings, and crackles that would be smoothed over by more polished recording techniques.